Do you see the performance of your Facebook Ads start to drop after a few days? If so, then your ads are falling victim to Ad Fatigue. In this article I’ll discuss the danger of Ad Fatigue and how you can use Ad Rotation to combat it. I’ll give you a breakdown of how Facebook Ad Manager can help with Ad Rotation and identify the 4 most effective Ad Rotation strategy to ensure you know how, when, and why to act to optimize all your Facebook ads. How often should I rotate? Some experts say to rotate your ads weekly or every two weeks, others suggest every three days. Others say to have two or three ads revolving constantly. Personally, I’m a big believer in the fact that your business is unique; your marketing strategy is unique, and so are your Followers. Ignore the ‘rules-of-thumb’ and instead keep a close eye on your CTR and Frequency metrics. Change your ad when Frequency increases and your CTR decreases. What range you’re comfortable with for these two metrics is up to you and your business. You can create as many versions of your advertisement as you like, but they’re useless unless you know whether or not they’re working. That’s where Facebook Ads Manager comes in. Frequency is the average number of times people saw your campaign’s advertisement. Watch that your Frequency metric doesn’t get above eight(Wishpond’s maximum Frequency decided upon after testing). An increasing frequency rate coupled with a decreasing CTR means the same people are seeing your ads over and over and not taking action. Your ad has saturated the target market and the people who are going to click have and the people who aren’t going to click won’t. Actions detail all the people who took an action (like claiming an offer, clicking a link, installing an app, liking a page, RSVPing to an event,etc) within 24 hours of seeing - or within 28 days of clicking - on your advertisement. The Actions metric is especially important if you’re looking for conversions, in which case I highly recommend a conversion tracking tool. Your Click-Through-Rate is the number of times people have clicked on ads in your campaign divided by the ad’s impression. CTR is the most important metric for combating Ad Fatigue. Watch your CTR closely and in conjunction with your Frequency metric. Decide for yourself what CTR/Frequency number is acceptable for you and your business, and at what point you rotate an ad. Use the Response Graph to get a great visual representation of an ad’s performance over the course of its rotation. Pay attention to peaks to identify which variation of your ad works best. Pay attention to troughs to identify those variations that fail. Now that you know how to measure your ad’s performance, let’s take a look at the four top strategies you can implement to keep your ads optimized. It’s no great revelation that Facebook’s color scheme is blue and white. If you employ the same colors your ad will blend into the News Feed and people’s already tired eyes will skip over it. If your product image is blue (perhaps it’s unavoidable) try putting it on a colored background. BCHydro’s advertisement below is a great example of a bad mistake. Even if your title, text, CTA and offer are solid (which in this case they are) nobody’s going to see them if your colors don’t grab the eye. Remember, you’re competing on the News Feed with pictures of babies covered in spaghetti sauce. Vary your headline : Use your brand name, a call-to-action, and (my personal favorite) a question. Remember, your headline can be no more than 25 characters. Vary the main text : For the main text ( 90 character maximum), use language that speaks directly to your specific target audience. “How do your smell? Try new Acme Shower Gel and you’ll be smelling like this guy.” with a picture of a rose in a top-hat and monocle. Choose eye-catching images that look great when big, up close, and small. Don’t include text in your image. Avoid images with a lot of details. And always remember, you’re testing your images. See what works for you. 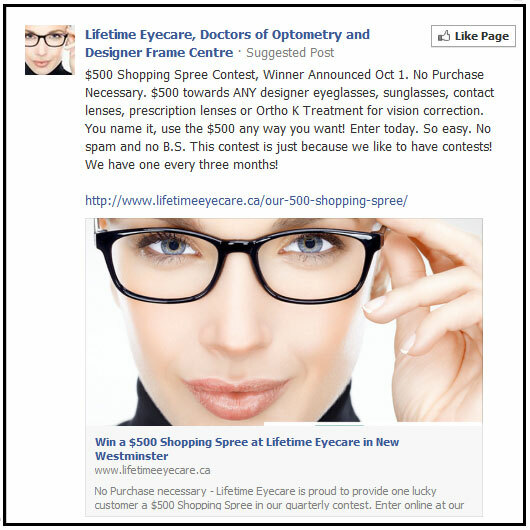 Apart from about 300 characters too much text, Lifetime Eyecare’s advertisement below is a great example. Your Facebook ad is useless without a strong and clear CTA. With Ad Rotation you should test out five or six different CTAs for the same product. Spots for our SEO Accreditation course are disappearing fast. Enter now! Need a resume boost? Earn SEO Accreditation with AcmeCert! Optimize your company’s internet presence with SEO Accreditation. Apply now! If you think your advertisement should be successful, but it has a decreasing CTR and increasing Frequency metric nonetheless, try changing the targeted demographic before tossing it out the window. Rotating your target demographics will keep Ad Fatigue low while still maintaining a steady stream of clicks. I’ve found demographic rotation to be extremely useful for advertisements that promote a contest. Contests are usually universally appealing so demographic rotation will maintain activity with the contest without causing Ad Fatigue or a decrease in CTR. Combating Ad Fatigue is one of the most important parts of advertising with Facebook. But more important than knowing how to combat is knowing how to prove you’re combating it - and that’s where ad manager comes in. Remember Facebook ads are pay-per-click, so you don’t lose out for trying something creative. 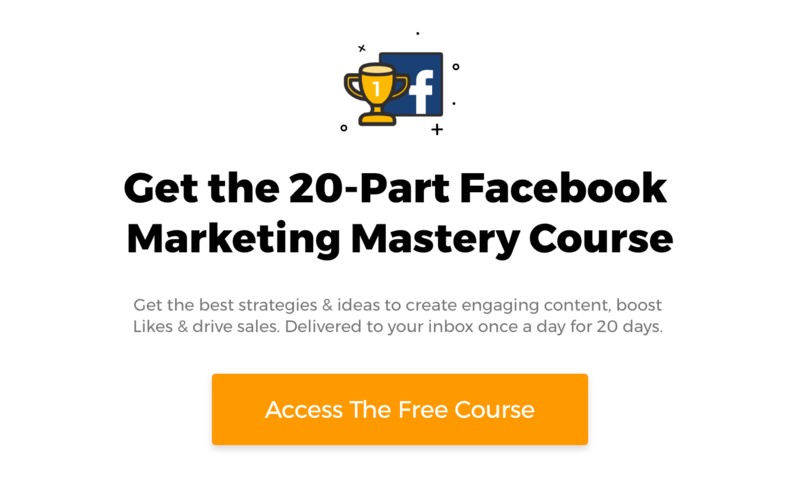 If you have any questions or comments, or have found success combating Facebook Ad Fatigue, I’d love to hear about it. Start the conversation below.